In May, I was able to make an all too brief visit to Chanticleer Garden on my way to a law school graduation farther north. The day was alternately sunny and cloudy, providing both opportunities and challenges for me as I roamed the grounds. I’ve written about Chanticleer in the spring before, so here I’m sharing only the newest images. As any devotee of this garden knows, however, Chanticleer is always evolving and there’s always something new to discover and photograph. My favorite image from the trip is at the end of the gallery. I was thrilled recently when one of my nieces saw it on my business Facebook page, and asked for a print of it. Hope you like it too. The Teacup Garden, awash in late tulips. A tri-color beech espaliered against the walls leading into the Teacup Garden. Camassia in the Tennis Court garden contrasting with alliums in bloom. and in bright sun. The Serpentine is planted in winter rye. By now, tall sunflowers should be in bloom there. A small stone bench on one side of the Gravel Garden. 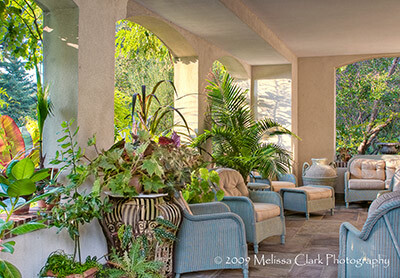 A secret “floating garden” on the veranda of the Main House. The arbor at the bottom of the Gravel Garden, which overlooks the Pond Garden and the Great Lawn, is rich with wisteria and alliums in the foreground. I’ve been a member of the Association of Professional Landscape Designers (APLD) since 2003. Despite the fact that I’ve won a couple of design awards from this organization and am delighted to be a certified member, until this year I had never attended any of its annual conferences. This year, I vowed, would be different. My son had just moved to the Bay Area and the conference was being organized primarily as an opportunity to tour gardens throughout the area, meeting some of the designers and learning through seeing in person, with written materials delivered via iPad rather than exclusively in lecture settings. But what really cinched the deal for me was when I learned that the very first event of the tour would be a visit to Flora Grubb Gardens – a dinner reception the night the conference opened. I’ve developed a real love for succulents and consider it somewhat unfair that the most enticing varieties aren’t hardy here. I do have a client with an incredibly wet back yard, save for one area where we have planted lots of creeping sedums and included sempervivums along with other rock-garden plants like Gaura and dianthus. But it’s too cold for agave, and we often find we have to replace the sempervivums in the spring if the winter has been wet. At Flora Grubb’s store (out a ways from central San Francisco), we ate dinner from food trucks but mostly lusted after the plants, the pots, and the other garden furnishings on display. A bicycle planted with succulents, carnivorous plants in a sink, air plants decorating a freestanding wall, and a vertical wall hanging planted chock full of succulents. I’ll just stop chattering away and let the photos speak for themselves. It was nirvana. A chartreuse bench beckons visitors to the store. In the foreground, agaves and phormiums are grouped with other plants. It’s a jungle in here – of the best kind. A large vertical panel planted with lots and lots of succulents was in one of the back rooms. A wall hanging that caught everyone’s eye. Wish I had it! Flora’s truck, decked out with succulents and other plants for sale. A “potting bench” with wares for sale. Pitcher plants in a sink! Tillandsia plants (which need no soil) decorate a small free-standing wall in the shop. Blooming succulents as a centerpiece. The store sells pots in varying sizes – simple in this case so as not to detract from the agaves planted in them. A wall of multi-colored garden chairs makes an artistic display while providing a clever storage solution. A bicycle serves as a “planter” in the store, decorated by talented staff. For more information about Flora Grubb, including links to her Web Shop (where I just ordered some great little holiday gifts for clients), click here. Speaking of holiday gifts, I’ve just turned two of my Blurb books into e-books if you’re interested in having a virtual copy. Chanticleer: A Pleasure Garden can be purchased as an e-book for $4.99 by clicking here, and the Garden Conservancy Open Days book (priced at $3.99) by clicking here. I can attest that they look great on an iPad! Summer at Chanticleer marks the point at which this garden, outstanding in any season, starts to come into its own. For years the talented horticultural staff at the garden, who are given more or less free reign in their individual areas to experiment and change plantings, have sought to push the envelope in terms of zone hardiness, mixing tropicals into more sheltered areas and using them as annuals in others. The Serpentine starts to strut its stuff. The Cutting Garden overflows with offerings for containers inside and outside the Main House as well as the visitors’ restrooms. This weekend I’m here at the garden, taking part in the current Master Garden Photography Workshop, with Roger Foley. Here’s a sampling of some favorite photos from past summers, in no particular order. A view to some of the garden’s spectacularly painted chairs through the ginkgo-bedecked arbor at the back of The Serpentine. An old beech tree which had died was painted this gorgeous shade of teal for a year before it was taken down. Brilliant craftsmanship is evident everywhere, even in the gates, in this garden. Near the Main House, gorgeous container plantings of succulents are everywhere. A view of the hill plantings and in the distance, the Pond Garden, in summer. Garden Shoots will be on vacation until after Labor Day. See you in September! 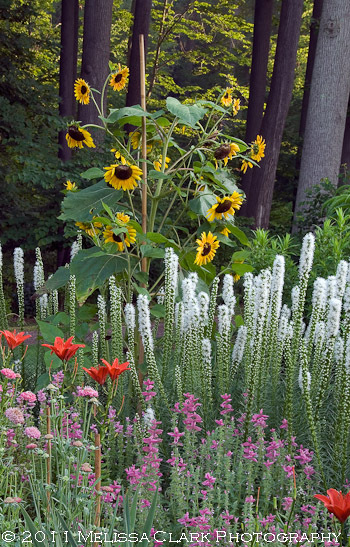 As most of you know by now, my favorite public garden on the East Coast (or in the continental US, for that matter) is Chanticleer Garden, in Wayne, Pennsylvania. 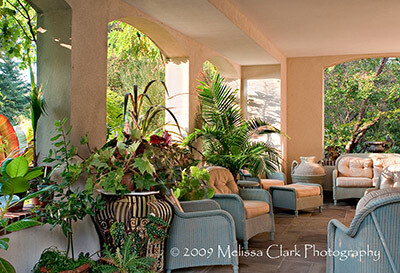 I’m looking forward to this fall’s annual pilgrimage to the Master Garden Photography Workshop there in early October. 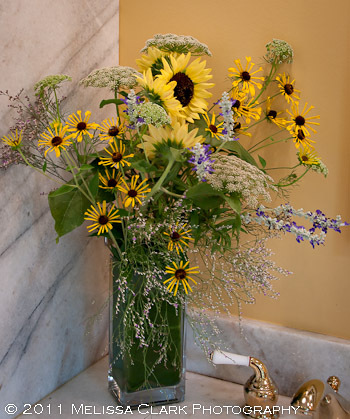 One of the many delightful aspects of the garden is its inspired use of cut flowers in (among other places) its public restrooms. 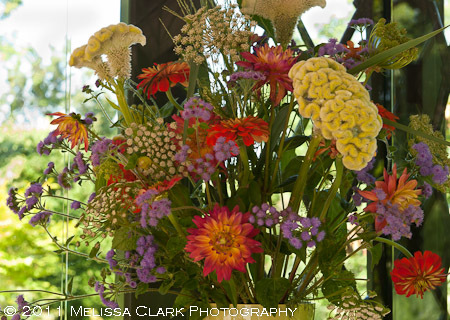 Over the last couple of years, whenever I’ve visited, I’ve shot images both of the current “bouquets” in those areas as well as from the Cutting Garden itself. Here’s a sampling of the combinations I’ve found throughout the garden. An enormous sunflower anchors a gorgeous combination of summer flowers in the Cutting Garden at Chanticleer in July 2010. I like this image so much I've framed it and hung it in my own home. 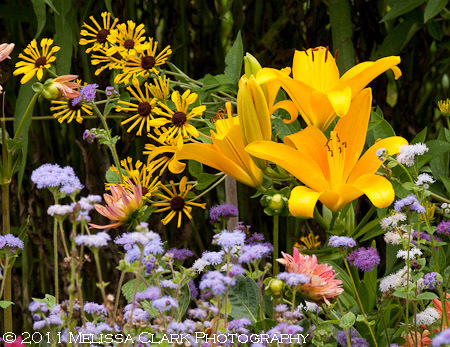 Lilies, rudbeckia, and other annuals in the Cutting Garden in August 2010. And now, the masterpieces created from the Cutting Garden. Please note (ahem) that at least one of these photos was shot in the men’s restroom (albeit before the garden opened to the public). 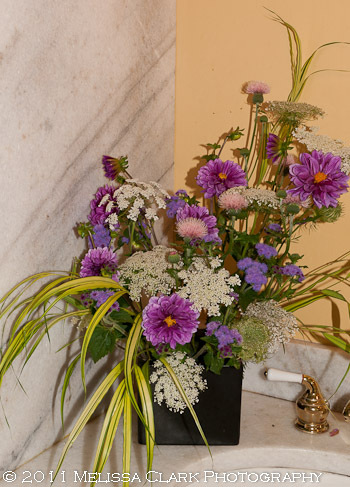 The restrooms at Chanticleer always have amazing cut flower bouquets at the washbasins. 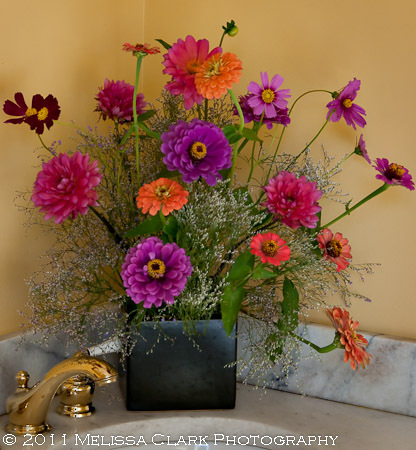 A late summer/early fall arrangement. And visitors are always greeted with astonishingly beautifully arranged cut flowers in the outdoor visitors’ gazebo. Gorgeous. What else can I say? Chanticleer is open until the end of October. If you’re in the area, or within an easy drive, don’t miss it. Garden Shoots will be on hiatus until early September. One problem that you face if you want to photograph a room and the view from its windows is exposure. The eye can see a much larger range of tones from very bright to very dark than a camera lens is capable of recording. So recently photographers have discovered HDR (high dynamic range) imaging, which involves taking multiple images at different exposures and combining them using a software program such as Photoshop or Photomatix. Sometimes the results can look a little funky if you’re not careful. In other situations the final result is much better than what you could get with a single exposure. As a garden photographer, this isn’t an approach you can often use successfully in all-outdoor settings unless there is Absolutely No Wind At All, since you usually need about five exposures and any movement of trees or plants will screw the whole process up. Last October, however, in a photography workshop at Chanticleer Garden, I found myself with a situation in which I could try an HDR approach, so I did. Below are two images – the first one processed as a single image in Lightroom and then Photoshop; to produce the second one, five images were processed in Photomatix. This shot was processed as a single image in Lightroom and Photoshop. Five exposures were combined in Photomatix to produce this image. The single-shot image has more “punch” to it, but some of the areas seen through the veranda openings verge on being blown out, even though I lowered their exposure as much as possible in Lightroom and Photoshop. The HDR image is more muted, overall, but both the “outdoor” views and the indoor furnishings are more evenly exposed. What my mind’s eye remembers is more like the HDR image, but I welcome comments and feedback as to which photo you prefer.